At this year's Game Developers Conference in San Francisco, I was honored to give a presentation entitled Homefront to God of War: Using Music to Build Suspense. While I've certainly discussed techniques for building suspense in this blog before, the talk I gave at GDC expanded significantly on that discussion and included lots more research and practical examples that we haven't previously examined here. With that in mind, I'm excited to begin a five-part article series based on my GDC 2017 presentation! During the course of these five articles, we'll be taking a look at some of the best techniques that enable video game music composers to introduce suspense into their music, control tension levels during gameplay and keep players engaged. So, let's start by defining the core concept. What exactly is suspense? As a result, our heart rate increases, our palms get sweaty, our bodies release adrenaline, and the whole reaction can feel like a drug-induced high. In game design, stimulating this physiological reaction is highly desirable – when we’re in this state of physical tension, we actually become emotionally suggestible. Expert developers can essentially tell us what to feel, and we’ll feel it. In the field of psychology, this is well documented as the “Schachter-Singer theory,” otherwise known as the “two-factor theory of emotion." In their experiment (published in Psychological Review), the two researchers Schachter and Singer dosed test subjects with adrenaline. They put each test subject in a room with someone who either began doing silly, happy things (like throwing paper airplanes), or angry and aggressive things (like loudly complaining about the test). The adrenaline dose played a significant role in the behavior of the test subjects, but the behavior varied significantly based on the test variables. As long as the test subjects didn’t know they’d been dosed with adrenaline, they would take up the emotional reaction of the person they were with – whether it was cheerful or irate. However, those test subjects who knew that adrenaline had been administered didn’t become emotional, because they knew where their symptoms were coming from. Now, without that knowledge, the physiological response creates a susceptibility to emotional suggestion. That’s why it’s such an awesome tool for game developers. If we can stimulate enough physical tension and suspense, we can potentially control the emotions of our players. So, what role does music play in all this? Several studies have shown that music stimulates the same heart rate changes, galvanic skin responses and adrenaline surges that we associate with a state of heightened tension and suspense. In a study published by Neuroscience Letters, researchers from the University of Montreal used electrodes to monitor the autonomic nervous systems of test subjects who listened to music. They found a direct causative correlation between the intensity of emotion in the music and the intensity of the nervous system response. Another study conducted at Stanford and published by Physiological Psychology took a closer look at the tingling physical sensation associated with the release of adrenaline, testing what stimuli would best provoke it. The study found that music was the most powerful stimulus for inciting that tingling adrenaline rush. So, if music is one of the top tools for bringing about the physiological symptoms associated with tension and suspense, then what are the best musical techniques to deliver on that promise? The name of this technique is fairly evocative of the horror genre in which it is very popular and frequently used. And yet, this technique can be used in any kind of game, in any genre, for any intended player base. For instance, when I was composing music for the Homefront: The Revolution shooter, I thought a lot about how to ratchet up the suspense. Homefront isn’t a horror game, but there’s a ton of dread haunting the characters, and the enemies in the game give off that aura of invulnerability that we associate with nightmare monsters, so I treated the game like a horror project. Games in the horror genre are famous for exuding a pervasive atmosphere of foreboding – making players feel edgy, as though there’s no safe place anywhere. Things can go wrong no matter where you are. Horror games are full of ominous spaces – but any game can have them, and they’re very useful for enhancing suspense. The key is to create the right aural ambience to enhance the ominous mood. Sound is key in creating an ominous ambience. Some great examples of this can be found in the films of director David Lynch – we know him best for Mulholland Dr., Blue Velvet, and the Twin Peaks series. Ambient sound in a Lynch film doesn’t always make logical sense – it creates a mood, an emotion. We have no idea where these sounds might be coming from – and we don’t care. In this way, Lynch ambience has more in common with musical score than with sound design. Let’s take a quick look at an audiovisual montage created by video essayist Jacob T. Swinney that illustrates Lynch’s use of sound to create an ominous ambience. When you’re watching the video, notice that most of the environments have a dissonant musical tone – usually in the midrange. This tone becomes very apparent when you play several short clips one after another. The tones leap out, and the environments start feeling like notes in a melody. So, you can see how the Lynch films use the Ominous Ambience technique, but this sound-design influenced philosophy can be integrated into musical applications. When using Ominous Ambiences in our composition, we shape musical sound to mimic environmental atmosphere, without worrying about realism or attribution. The sounds may be environmental, but not particularly appropriate to the location, and the listener won’t know where the sounds are coming from or what’s making them. Let’s take a look at an example of Ominous Ambience – this is an excerpt of my music from the Homefront: The Revolution shooter. The clip takes place in a war zone that requires gas masks. It’s oppressive, and the video game music follows suit. Notice the dissonant midrange tone that continues through most of the clip, and the metallic sounds that work to increase the tension. The Ominous Ambience technique sets us up for the ending of the scene – the tension paves the way for what hopefully comes across as a surprising moment of violence, when the player character is knocked unconscious. Now let’s look at a very different example of the Ominous Ambience method, this time in a much more light-hearted game. So this concludes part one of this five part series based on my GDC 2017 talk, "Homefront to God of War: Using Music to Build Suspense." In part two we'll be exploring the 'Jarring Jolt' technique, including multiple strategies that a video game composer can employ from both the music composition and sound design fields. I'll also be discussing examples from my music for the Assassin's Creed Liberation and Speed Racer video games. In the meantime, please feel free to share your thoughts in the comments section below! 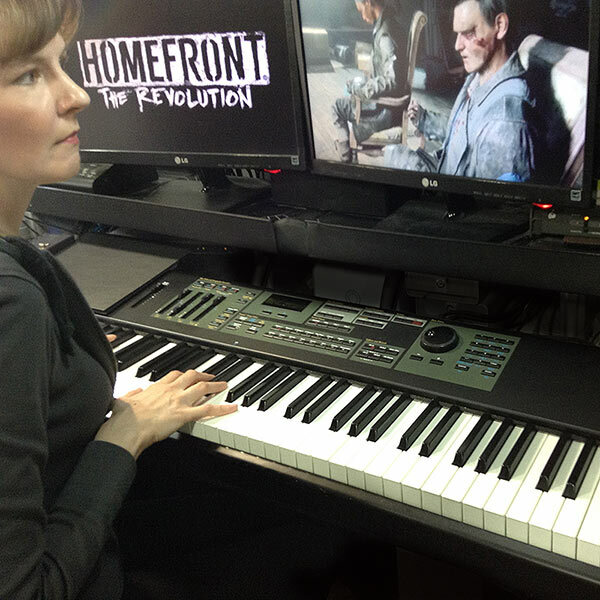 Winifred Phillips is an award-winning video game music composer whose most recent project is the triple-A first person shooter Homefront: The Revolution and the Dragon Front VR game for Oculus Rift. Her credits include five of the most famous and popular franchises in video gaming: Assassin’s Creed, LittleBigPlanet, Total War, God of War, and The Sims. She is the author of the award-winning bestseller A COMPOSER'S GUIDE TO GAME MUSIC, published by the MIT Press. As a VR game music expert, she writes frequently on the future of music in virtual reality games.